To help you get the most out of your website in 2019, we’ve put together a list of things we recommend as best practice in digital strategy. Make sure to speak with your digital agency about how you can update and build upon your strategy this year to reflect current trends in web design and development. In the simplest terms, MVC is an architectural development pattern. It requires your website’s code to be reorganised and separated into three parts: the Model, View, and Controller. The MVC pattern was introduced to the web in the 1990s and has been quietly evolving ever since. Now it has reached the point where most developers are more familiar with MVC than any other architectural pattern. Recently, a lot of this has to do with Microsoft’s shift towards MVC. Before, Microsoft’s software framework (.NET 4) supported both MVC and Web Forms architectural patterns. The new Microsoft platform .NET Core (previously called .NET 5) is designed to only support MVC, indicating that Microsoft views MVC as the development pattern of the future. What does this mean for Kentico? This is exciting news for CMS (Content Management System) providers like Kentico. With more developers now training in MVC, and new Microsoft software making the switch, Kentico has seized their opportunity and embraced MVC as their preferred pattern. The transition to MVC in Kentico 12 has already started paying off. The MVC pattern provides the means for many new features in the Kentico 12 CMS, like Smart Forms and a visual Page Builder. Should I transition to MVC in Kentico 12? It’s no secret that we’re big fans of Kentico, even more so now we get to play around and develop even better websites with MVC. So yes, if you can, we firmly believe you should transition your website to MVC. In such a fast moving digital landscape, it’s important to stay up-to-date with changing technology to be an industry leader. Keeping on top of developments and new software updates ensures you get the best features on the market and will continue receiving support from platforms you use. Transitioning your website to MVC in Kentico 12 offers benefits directly from the website architecture, and improvements that Kentico can now offer through their platform. When you transition your website to MVC, you’re choosing a better development model that’s proven to be the development pattern of the future. Separating the website architecture into three parts provides a faster, streamlined development workflow. This means less wait time for things being built. The large eco-system of open sourced MVC software enables faster development and provides less vendor lock-into a particular platform. The MVC pattern introduces at least two applications to the Kentico platform. One is the Kentico administration and one is the MVC application that hosts the site. Benefits of the dual application approach include improved security in the administration application, and improved website performance from separate caching. 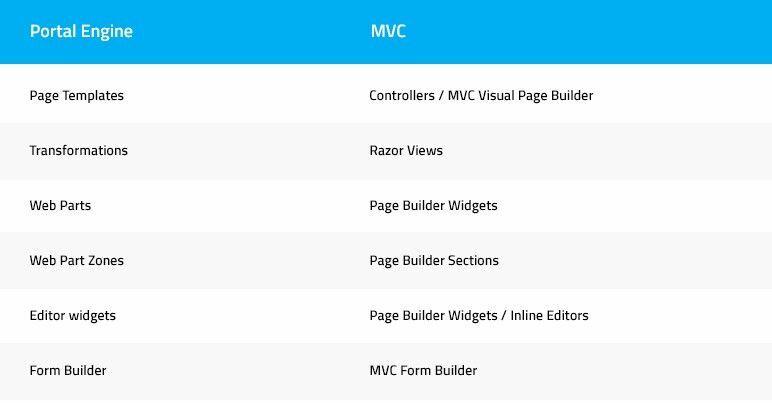 The MVC pattern provides greater flexibility in how your site is developed and how components of your site are presented. However, it’s important to note that MVC works very differently to the old Kentico Portal Engine (built using Web Forms). The major differences are outlined below. Transitioning to MVC in Kentico 12 is no small feat. It is, however, a necessary one to ensure the longevity of your Kentico website. The Kentico Portal Engine will continue being supported until 2022, but web development using the Portal Engine will stop in 2020. As of now, Kentico has adopted a MVC-first approach. This means that new features will be designed for MVC, while the Portal Engine is phased out. The key to transitioning your website to MVC is in the planning. Depending on the size and complexity of your site, you may need to start the planning process well in advance of the MVC implementation. This announcement by Kentico is by no means reason to panic. There’s still plenty of time to start planning your transition to MVC. In the meantime, you might want to start thinking about your website’s future and the role it can play in your digital strategy.